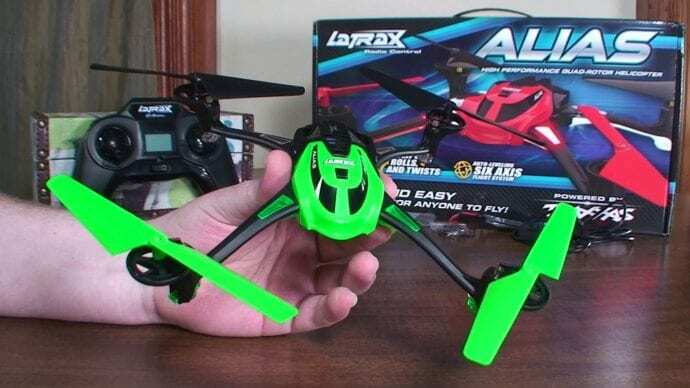 The LaTrax Alias is a next generation quad-rotor copter that is a great choice for both beginners and quad pros. Equipped with features that are beneficial for any drone user, as well as high-tech and capacity capabilities, it’s a model that you’re not going to want to miss. To see a thorough tutorial on how it is set up and flown, watch this video. Be Aware: As an RTF drone, you can open the package and fly it straight away. There is no application needed for the Alias, which is great for those who do not have a smartphone but want a drone that is capable of everything a smart drone has. The controller, labeled as the 2.4GHz Multi-Mode Transmitter, gives full control and a comfortable flying experience with the thumb stick pads. It looks almost identical to a video game console controller, especially the PlayStation. Crafted from a molded composite, the UAV comes in 4 different color assortments and has the dimensions of 14.78 x 14.78 x 1.69 inches. 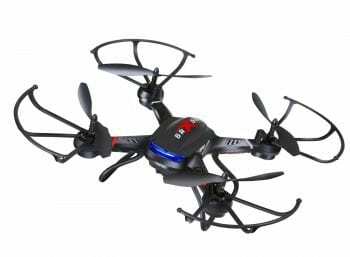 The overall flight weight with the battery included is approximately 3.53 oz or 100g, the Alias was designed to have an auto-leveling 6-axis flight system and a 4.2GHz 6-channel Multi-Mode radio system. It’s designed for a smooth, safe flying experience that reaches out to both basic beginners and veteran experts alike. The unmatched quad-rotor thrust paired with the auto-leveling 6-axis stability, flight system, ensures that the drone flies like a hot knife through butter, without having to worry about a crash landing. The design incorporates a light enough material so ensure that the drone is one of the lightest of its kind, and that it is ultra-responsive and lightning quick. Overall, the unique flight control system allows both new and old drone users to be able to master and experience the art that is flying a UAV. 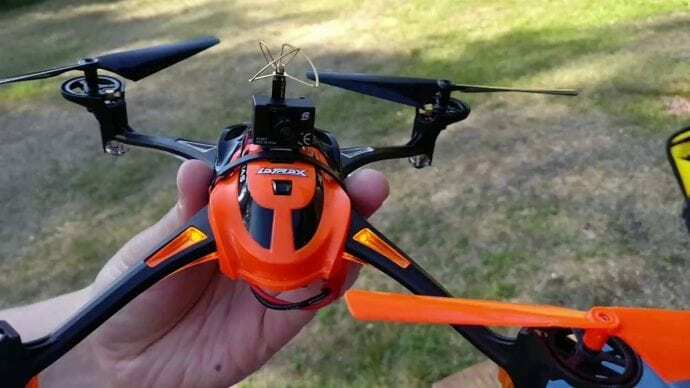 The elevated rotors were designed to ensure that they cannot become tangled in trees, for example, should a crash happen or an obstacle is in the way. The weight of the entire drone is also minimized thanks to the design of the frame, while still remaining sleek in style. When it comes to durability, this drone is practically indestructible. Crash damage is not a worry, mainly because of the 50% power increase, which helps ensure full snap-back control in the case of an accidental crash. The molded composite and high-technology overall construction aspects bring drone durability to an entirely new level. To get an idea of how durable the drone truly is, please watch this video. The Alias does not come with a camera, but there are multiple different accessories that can be used and incorporated, which include multiple cameras that will suit your need just right. While sold through the manufacturer, you can also find cameras through retail dealers, and even on Amazon for a very fair price. The LaTrax Alias Camera is purchased separately as an accessory and is quite the powerhouse for such a small size. It’s very quick to install, is instantly recognized by the drone’s system, and automatically configures itself to the controls of the transmitter/controller. Videos and photos are saved into a micro SD card, which is also sold separately. The drone has a max SD card handling of up to 16 GB. The only downside of the camera is that it cannot record real time footage because it is not equipped with a FVP system. The battery is a 650mAh Lithium Polymer, also known as LiPo, powered drone with a voltage of 3.7V. 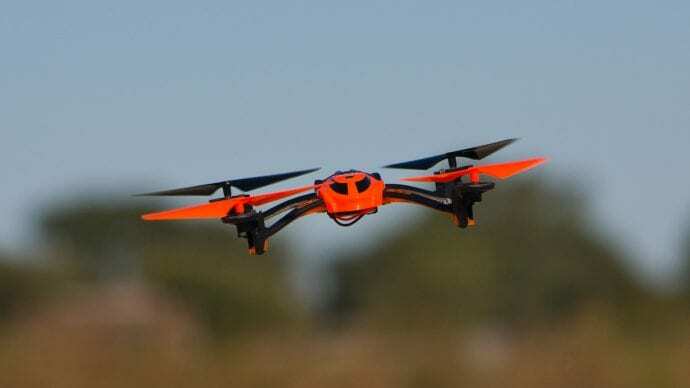 It allows for up to 15 minutes of flight time, which is not much when compared to other drones of its kind. However, the Alias drone is quite a simple yet powerful drone, so there is a lot that can be done covering ground wise during the battery span of 15 minutes. The USB-powered LiPo Charger is included with the battery pack, which takes Traxxas AAA Alkaline Batteries. 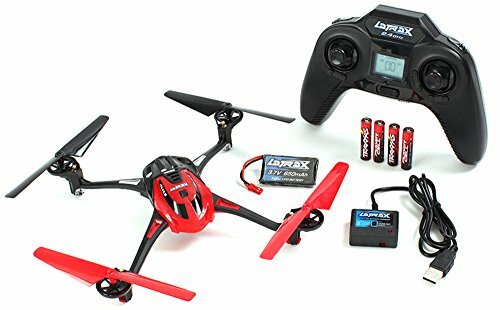 You will find that 4 batteries have been included with the LaTrax Alias drone when you are opening the box. To learn more about the battery and flight times of the LaTrax Alias, watch this extensively thorough review. The controller, also known as the transmitter, for the Alias looks just like a PlayStation controller and is just as easy to use and comfortable. Interestingly enough, a cue from console controllers was taken to ensure that the controller is comfortable enough to be used for longer periods of time, after the drone has been charged multiple times, of course, especially when you look at the pads that go onto the thumb sticks or joysticks. 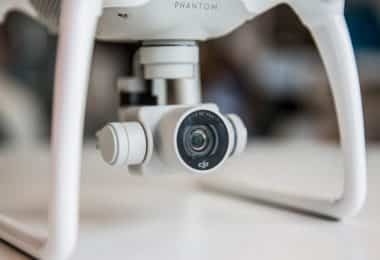 The precision gimbals are tuned in the software to ensure that the user has a solely connected feeling with the drone, as it immediately responds to the inputs made through the controller itself. 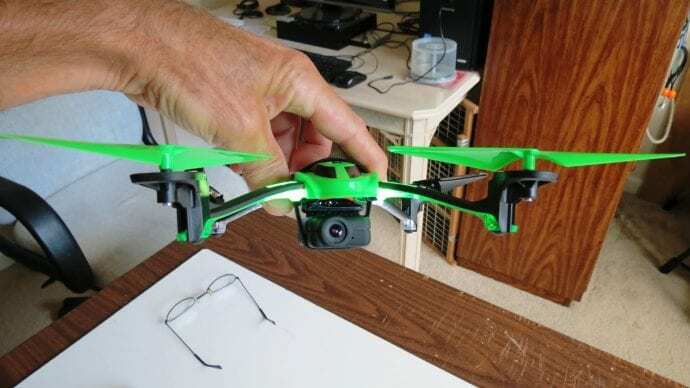 It even features a fuel gauge for the battery life in both visual and auditory aids to let the user know when it’s time to bring the drone down and recharge. Basic beginners and veteran professionals will both enjoy the feel and interactive capabilities of the controller, and will actually help in sharpening all skills needed for a successful flight. When it comes to the flight experience, the drone is limited to only 10 minutes of flight time, but that does not mean it is not an exceptional drone. The 4 high-output motors allow for a 50% more powerful flight performance when compared to other drones and those who only have a standard motor. The integrated bright, colorful LED lights make for a beautiful sight in the sky, and you can even customize the lenses by selecting from and purchasing 5 different LED lenses through the manufacturer. Different color selections and schemes actually make for a better flight performance where aesthetic is concerned. They help the user to have superior distance and closer visibility of the drone, which can help you to avoid a crash. This is furthered by the rotors automatically preventing themselves from getting tangled in grass, trees, etc. 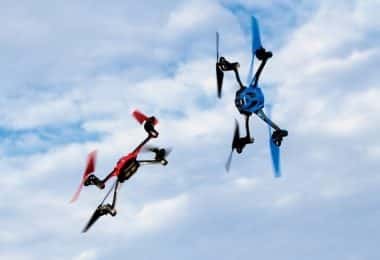 Because the drone only weighs up to 3oz, it’s incredibly fast, easily steered, and can make even the most difficult of aerial tricks during flight. Overall, the flight performance of this drone is just as smooth and sleek as the design. To see more of the flight performance of the LaTrax Alias drone, you can watch this video. 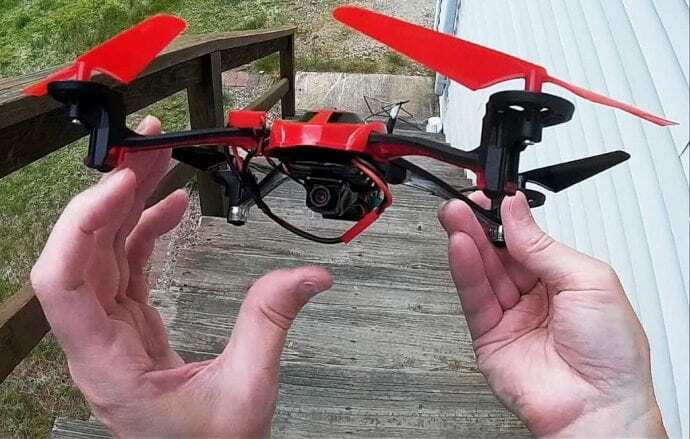 For such an incredible drone, the price is actually very surprising. 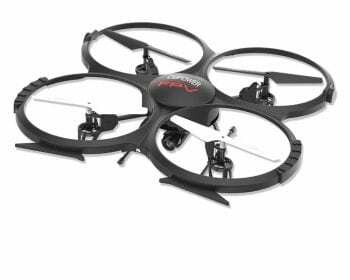 Priced at approximately $110.00 through the manufacturer, and approximately $100.00 through Amazon, the Alias is cheap enough for beginners to sink their teeth into, and even cheap enough for veteran fliers to invest in, for a more fun flying drone. The controller is included with the drone itself, as well as enough batteries to make a dent in your small investment in the kit. However, the camera, if you choose to buy it, comes separately, but is also a very small investment, costing only $50 through the manufacturer and $55 through Amazon. As for the 120 wide-angle lens for the camera, it’s also a very good value for what you are getting should you choose to purchase one. It costs only $22 through Amazon. Overall, if you purchase the drone, the camera, and the lens, you are looking at spending approximately $200 if you purchase everything through the manufacturer’s website and approximately $180 if you make your purchases through Amazon, which is a fantastic value for everything that you are getting. There is also a lifetime electronics warranty on the drone through the manufacturer, as well. 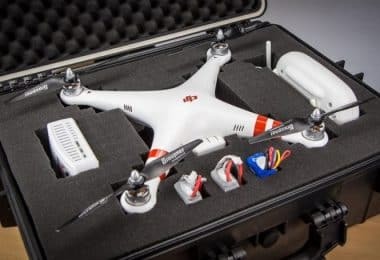 The additional canopies, rotor blade sets, LED lenses, and more accessories can be purchased straight from the manufacturer for a more customized drone. To see some of the tricks that this drone can perform, and more footage of the flight in general, watch this video. As previously stated, for the features you are getting for both the drone and the controller, and the additional camera and lens if you choose to make the adjustment, you are getting an incredible value. This video will show you what’s more on the features that are offered. 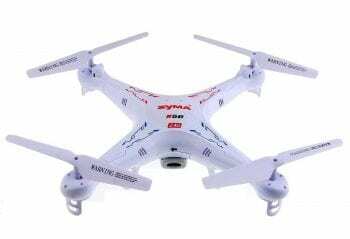 The Syma X5C is a drone that is quite similar to the Alias by LaTrax in many ways. The most obvious similarities would definitely be the 6-axis system which both drones have, as well as the controller capabilities that replace the need for an application that generally comes with the newer drones for flying. 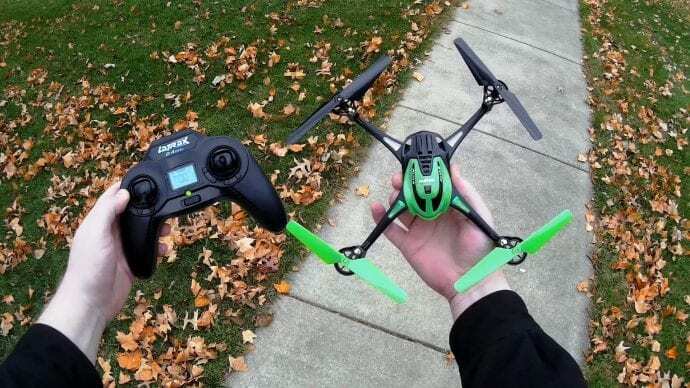 The X5C also comes with a button for performing tricks, just like the Alias, but this drone comes with a camera that is integrated with the drone and the system itself, whereas the compared drone does not and requires a separate purchase and installation instead. The Alias is the flight time winner, however, as it has a battery life of 15 minutes, whereas the X5C only has up to 7 minutes of flight time. The Holy Stone F181 Drone, with HD Camera, and a RTF 4 Channel 2.4GHz 6-Gyro Headless System, is also another similar, comparable drone with the Alias. 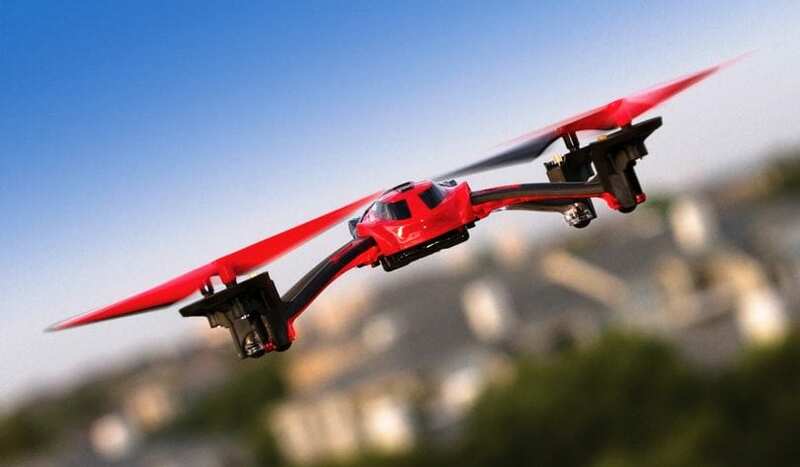 Like the X5C, it only has 7 minutes of flying time, whereas the Alias has 15, but the key similarities here are the ready-to-fly capabilities, 6-gyro or axis system, and the 2.4GHz controller factors. It also comes with a camera that is already installed and included within the drone itself, unlike the comparable model. Now the U818A FPV Drone might actually be a leader of the entire group. It does stand in the same price range as the Alias, and the rest of the squad, but because of the features it offers, we actually consider it to be the best of the mentioned. Okay, to be honest, it is a bit more expensive than the rest, $160 to be precise, but unlike the other models, this one offer altitude hold (which makes the flying a whole lot easier, especially for beginners), you can actually make 720p videos (we know that HD is old news, but with this price, not many models offer this resolution), comes with a FPV system which is actually VR set compatible, and the last, but by no means the least, it offers route planning! For $160?!? Is there a downside to this model?? Actually, there is… The flight time. It can stay in the air for some 7 to 9 minutes on one full battery, but the good news is that you get two batteries in the package, plus a power bank to recharge on the go. All in all, a model definitely worth considering. Let’s see general review for LaTrax Alias. For such an inexpensive drone, when you take the drone and accessories into consideration, you would think that you are getting a plain Jane for a drone, but instead, you are investing in quite a small powerhouse. 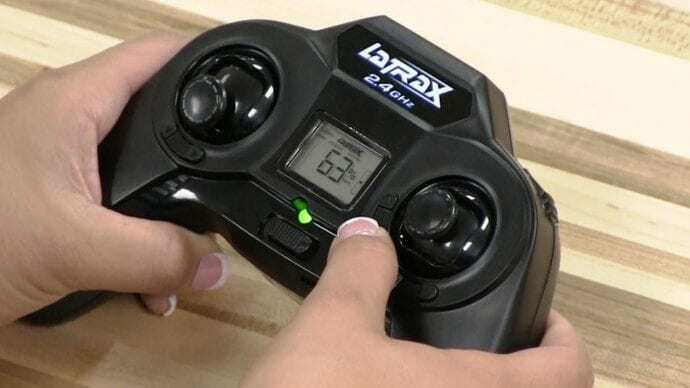 The LaTrax Alias is a drone that is perfect for beginners, expert fliers, and all in between. It comes with features that one would expect from an insanely expensive drone, has an average battery life and charge time, and allows for some pretty cool accessories, including the camera, LED additions, and plenty more. Overall, the Alias is definitely well worth the small investment you’ll be making, whether it’s through the manufacturer or Amazon, you literally cannot go wrong. The value is made even greater thanks to the lifetime electronics warranty, which makes this drone one of the best, both flying and investment wise.